Word is, the early plan for Disney’s live-action remake of their 1991 classic Beauty and the Beast did not involve a musical production. That soundtrack from Alan Menken and Howard Ashman is in the team picture of Disney’s all-time best, and director Bill Condon politely reminded studio bosses that without it…what’s the point? Sanity prevailed, and Condon brings the familiar tale to life again with a lush, layered, often gorgeous vision, celebrating the brilliant songs that helped make the original the first animated film to garner a Best Picture Oscar nomination. Condon’s directing his first musical since the excellent Dreamgirls, and he hasn’t lost the instinct for staging a show-stopper or two. His camera pans and zooms during “Gaston,” revealing a village full of buoyant choreography, while the title song gets an intimate, classic treatment that builds upon a possible decades long investment in these characters. “Be Our Guest,” the early request from various castle housewares to the captive Belle (Emma Watson), emerges as a joyous Catch-22. We can’t wait for Lumiere (Ewan McGregor) and the gang to start singing…but it is a hard act to follow. 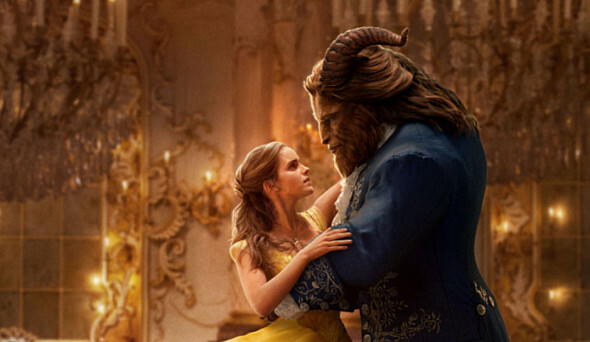 Watson delivers a spunky Belle who’s more industrious than the animated version, yet at times bland next to the gregarious Gaston (a scene-stealing Luke Evans) and the often distracting face of the Beast (Dan Stevens). Even as wondrous visuals fill frame after frame (see the 3-D IMAX version if you can), CGI facial features can’t quite keep up, and choosing this tract over makeup artistry feels like an ambitious misstep. The supporting cast, including Emma Thompson, Ian McKellan, Kevin Kline, Audra McDonald and Josh Gad, is delightful at every turn, and shows more welcome diversity from Disney. The brouhaha over the sexuality of LeFou (Gad) proves as inane as expected, though it does add some sly gravity to Gaston’s campaign against the Beast. As he rallies the villagers by exclaiming there is “a threat to our very existence!” Gaston leans in to LeFou and asks, “Do you want to be next?” Well played. Add to this a diverse array of townspeople, two high-profile mixed-race couples, and LeFou’s partners during the dance finale, and Disney’s path to progress grows more concrete. Devotees of the original Beauty and the Beast will have their nostalgia rewarded, but Condon’s vision has the flair and substance to earn its own keep. Though not quite as magical, there is something here that wasn’t there before. Call it maturity, call it pizzazz….or just ask the dishes.